3 day ticket for the price of 2! The easiest way to explore Dublin’s top visitor attractions! Collect your voucher from the Bus when hopping on! Could the Guinness Storehouse be crowned Europe’s best attraction? Things to do in Dublin on St. Patrick’s Day 2015! Deciding what to see in Dublin made easy! 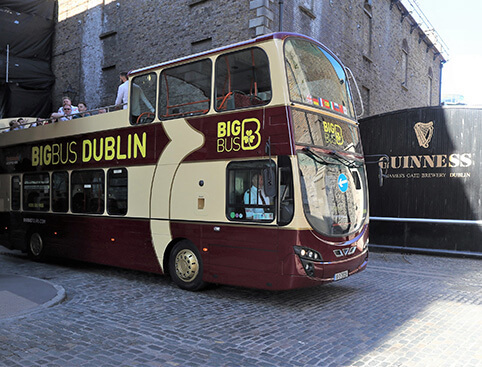 Take an open-top bus tour with us and raise a glass at the Jameson Distillery, discover the Book of Kells at Trinity College, and meet the residents of Dublin Zoo. You’ll really learn the meaning of The Craic! Experience the sights and sounds of Dublin at your leisure. With over 30 stops to hop on and off, from Kilmainham Gaol, Croke Park to Samuel Beckett bridge, we’ve got your city break best bits covered. Tours with live guides and pre-recorded commentary in 8 languages available. Our hop-on, hop-off Dublin bus tours include either live English-speaking tour guides (Blue Line only), or recorded commentary in 8 languages. (Blue Line only), or recorded commentary in 8 languages. With fun and fascinating stories, you’ll get a real taste of Dublin and its history. 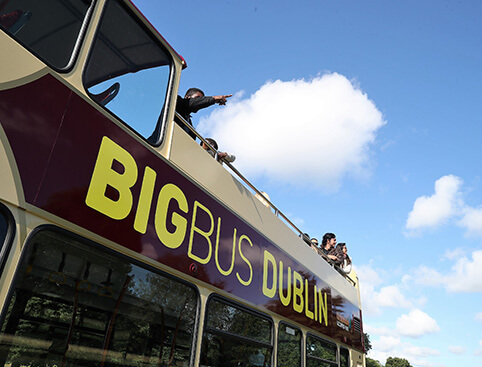 See the best of Dublin on our Blue Route Bus Tour. Along the way, our expert live guides will provide an entertaining, informative commentary about the sights ahead, including St Patrick's Cathedral, Trinity College and the Guinness Storehouse. During the tour, you're free to hop on and hop off the bus at over 30 different stops. Remain on board to relax and see it all, or hop off to explore the places that interest you most. Below, our Blue Route timetable lists the first and last times that Blue Route buses will call at each stop. 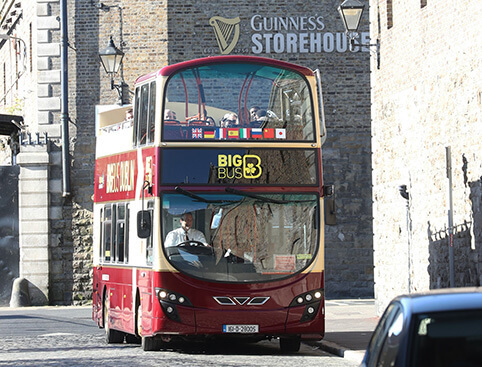 Explore the sights of Dublin on our Red Route Bus Tour. You can hop on and hop off the bus at over 20 different stops. Stay on board to relax and see it all with entertaining digital commentary, or hop off to explore the landmarks and attractions that interest you most. Below, our Red Route timetable lists the first and last times that Red Route buses will call at each stop. Discover Dublin by night on our panoramic Dublin Night Tour. See the best of the city as it sparkles after dark, and get in the mood for the evening ahead with our entertaining live guides, who'll make a song out of Dublin's fascinating facts and stories. Tours depart from Stop #1 (13 O'Connell Street) and last for 1 hour. 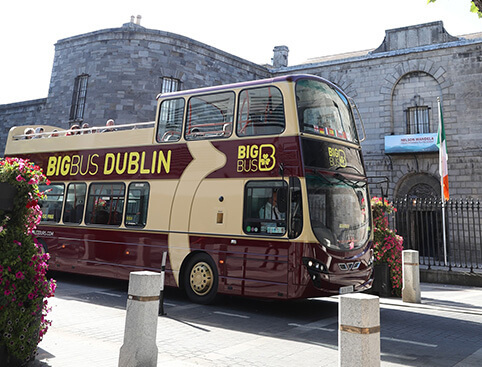 Please note that Big Bus Tours tickets are valid for City Sightseeing Dublin bus tours. City Sightseeing Dublin call at the same stops as Big Bus Tours, but they use a slightly different numbering system to denote each stop. The buses are accessible for wheelchair users. Each bus includes an informative audio guide in a choice of languages. One in two tours on the Red Line are now live guided. You can redeem your printed e-ticket at any Big Bus Stop or at the City Sightseeing Shop on 14 Upper O’Connell Street, Dublin 1. FREE YELLOW UMBRELLA WALKING TOUR with your ticket. Departs Dublin Visitor Centre 10:30 & 14:30 daily. NIGHT TOUR: Departure at 19:00 daily from Stop 1.